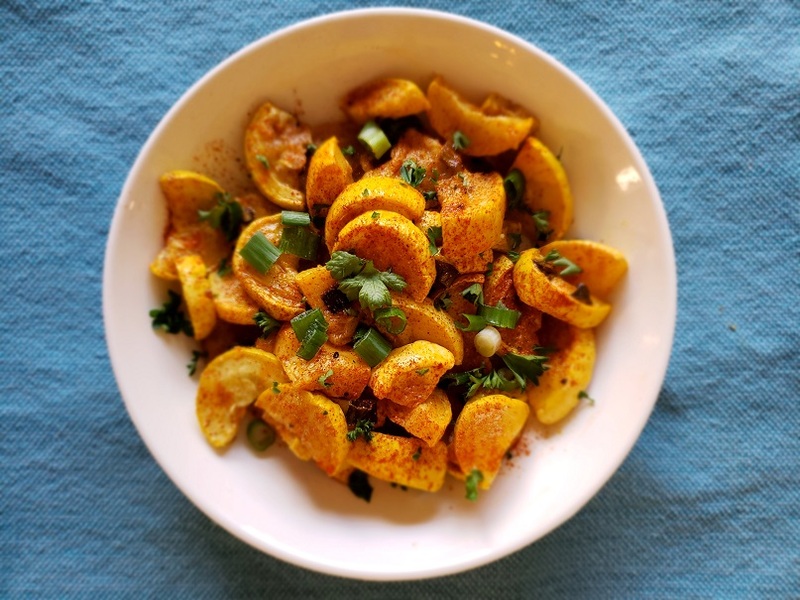 This lemon garlic roasted yellow squash was delicious! It is easy to prepare, about 10 minutes, and really was quite good. I love finding new ideas to put more veggies in my life! I was challenged a couple of weeks ago by one of my clients who asked me for more ideas for side dishes. I was stumped. I realized that my side dishes are often quite boring! I decided to come up with some new, interesting, tasty, and easy ideas for vegetables sides. This is the second of my new ideas (it is actually really hard to come up with new recipes!) The first one was kale chips, which were such a hit with the whole family! https://nourishednutritioncounseling.com/chili-kale-chips/. Prepare a baking sheet by lining with foil and spraying with cooking spray. Wash squash, chop ends off. Then slice and quarter slices to get bite sized pieces. Arrange squash on prepared baking sheet. Mix olive oil and lemon juice together in a small bowl and drizzle over squash with a spoon. Sprinkle garlic powder, paprika, salt, and pepper over squash. Bake for 40 minutes or until squash is tender.